Mauritius is idyllically situated in the Indian Ocean, approximately 2,400 km off the south-eastern coast of the African continent, and has long been a popular destination with honeymooners and other holiday makers looking to combine the excitement of mainland Africa with a tropical beach destination. Covering an area of 1,865 square km or 720 square miles, Mauritius is a real paradise for those who want to enjoy the sea or just to soak up the sun. Endless white sandy beaches are lapped by the crystal clear warm blue ocean, and fringed with palm trees that sway gently in the breeze. For the more active, there is an abundance of watersports on offer, including snorkelling, water-skiing, para-sailing, sailing, windsurfing, surfing, jet-skiing, sub-water walk, kayak trips and much more. Diving enthusiasts will delight in the abundant of colours offered by the tropical fish and coral reefs, and deep sea fishing fanatics will crave the excitement of fishing for marlin or barracuda. Away from the sand and sea, golfers are in their element, with many excellent 9 and 18 hole courses to choose from, many offering ocean views from all the holes. For those looking for a bit of culture, head to the capital of Port Louis, in the north-west of the island. Bustling streets are filled with intoxicating spice aromas, and you can barter for leather goods at the Central Market. For a more cosmopolitan shopping trip, Grand Baie in the north is a popular destination for a spot of clothes and jewellery shopping. You can also party the night away here at some of the islands best bars and night clubs. Mauritius is a successful ethnic, cultural and religious melting pot, joining populations from India, China, Europe and Africa. English is the official language of Mauritius, although French is extensively used, as is Creole, and other languages include Hindi, Urdu and Bojpoori among others. As a result of this cultural and ethnic combination, the Mauritian cuisine offers a true taste of the East meets West, and visitors to the island can tease their tastebuds with Créole rougaille, Indian deep-fried delights, Muslim bryanis, Chinese chow mien and delicate French patisseries. 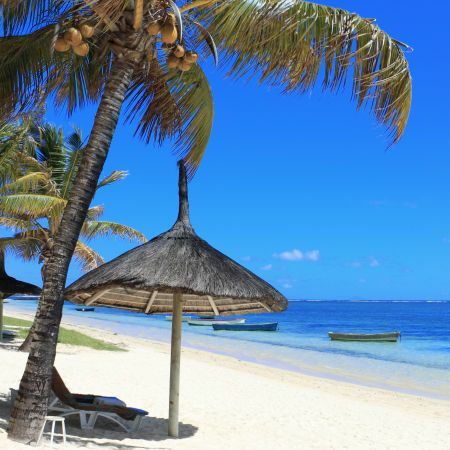 Mauritius enjoys a mild tropical climate throughout the year. There are 2 seasons - a warm humid summer, extending from November to April, and a relatively cool dry winter from June to September. The months of October and May are commonly known as 'transition' months between the 2 seaons. 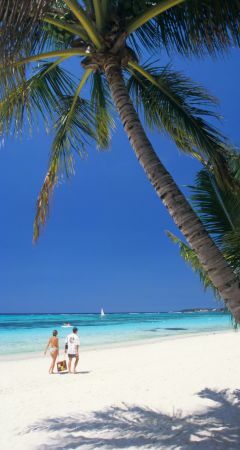 The most pleasant times of the year to visit Mauritius are between April and June, and between September and December. The cyclone season is from November through to April, but it has to be said that the whilst the island tends not to get hit by a full blown cyclone, these months can be characterised by hot, humid temperatures and tropical downpours. January and February in particular are the hottest months, and February and March tend to be the wettest. July/August are the coolest months. Find out more about the weather on different parts of the Island and the best time to visit Mauritius. Mauritius will enchant you and uplift your soul, making you feel that you belong to the chosen few. Every visitor enjoys personal attention and every encounter is an opportunity to discover a friendly face. Behind each smile lies the promise of a unique holiday that will in turn compel visitors to return to its shores time and time again. Below you will see a selection of the hotels in Mauritius that we work with to give you some idea of prices, but if you want a quote for somewhere else, please let us know! The hotel features 64 rooms split into Standard rooms, Deluxe rooms and Family rooms. The rooms are equipped with individual air-conditioning units, direct dial telephone, electronic safe, minibar, hair dryer, TV with local and satellite channels, and tea/coffee-making facilities.